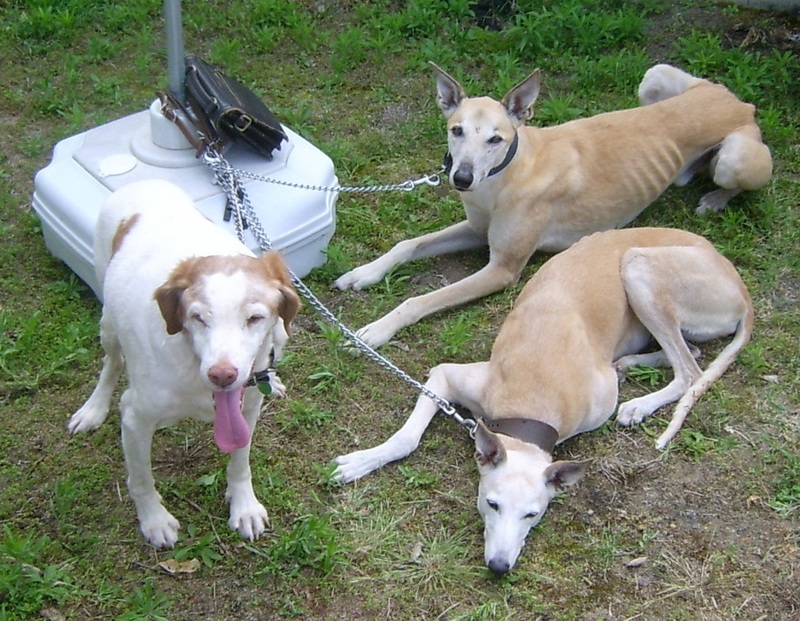 Lilac/Lottie/Alice - A fantastic journey, a happy life though a short one. Arcos Again, Is This 3rd Time Lucky? Sultan update. 4th journey. Permanent home at last? 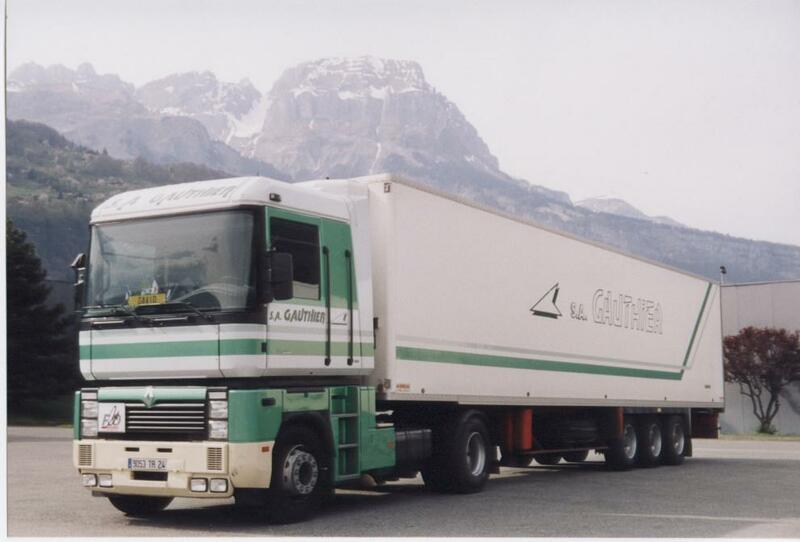 For many years, and in many countries, I drove lorries of all shapes and sizes. 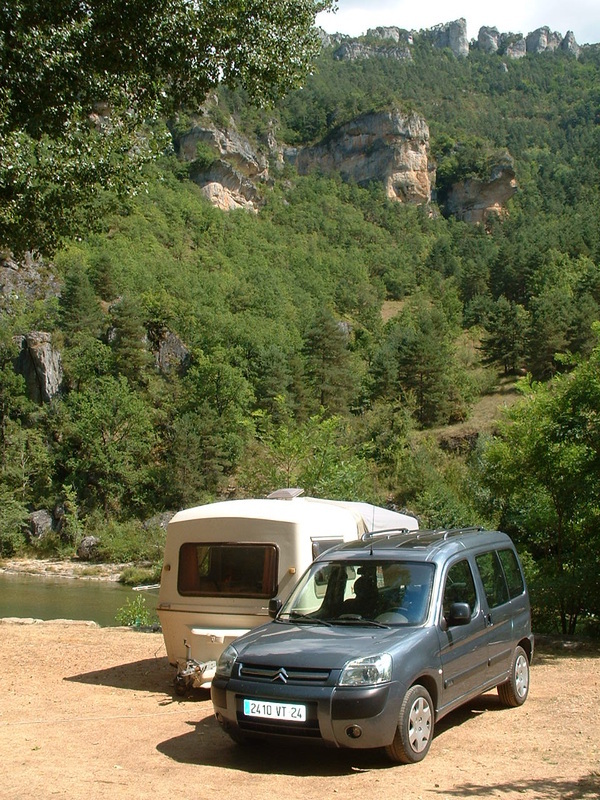 In 1999 I came to France to live and was soon working for a local firm driving my artic all over France and occasionally, beyond. As soon as we came to live here we adopted a dog, and then another and then a third. This gave us a contact with a rescue organisation, Association Phoenix, and before long we were taking in foster dogs on their behalf. At the end of 2002, at the age of 60, I retired and settled for village life with dogs, pétanque and community events and meals. Good as it was it wasn’t enough. I missed the road and the camaraderie of my fellow routiers. No longer with the caravan, too expensive, and the car has a bed now. .....and then added my name to a list of volunteers on a forum and stated that I was willing to transport dogs any distance and asked only a fair reimbursement of my vehicle costs. My first job was not long in coming. 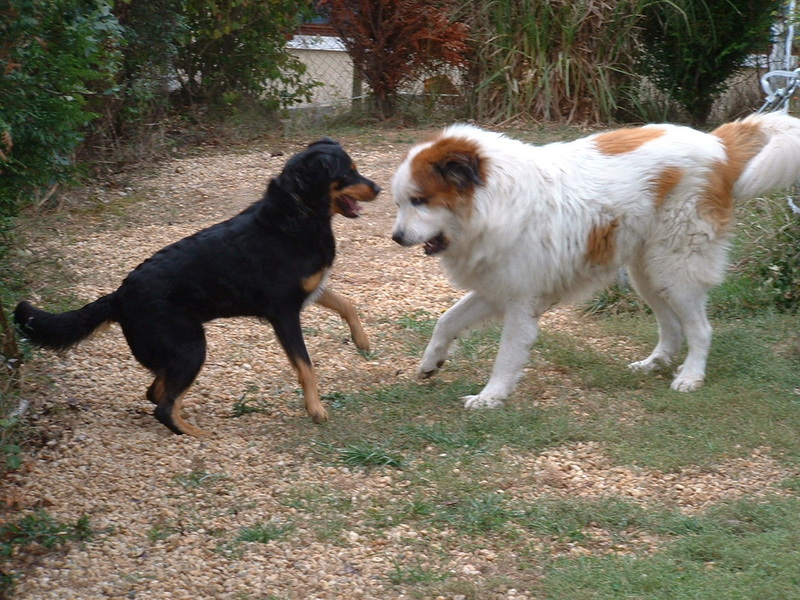 Two little dogs from the Lot and the Gers to Deux Sèvres. And so it began. In my first full year I did over 40,00 kilometres with dogs of all shapes and sizes and now work with many rescue associations all over France and in England as well as private owners recommended by them. What follows is an account of my travels and adventures with my dogs, with some of whom I have slept in the car, now fully kitted out with a comfortable bed once the secure cages have been folded and stored. When away from home I eat with my old colleagues, many of whom are familiar faces, in the famous routier restaurants all over France. The Berlingo with the Teardrop, on new chassis. Sleeping with dogs is fine, but, for reasons of space is limited to 1 big dog or 2 little ones. But first, the rear windows were darkened, to remove the need for curtains. Then, the addition of the Teardrop caravan. Light and very aerodynamique, unlike the tall Romahome, it cost no more to tow than not. After an initial design disaster, the chassis split in 2, and a subsequent year long legal dispute, the body was mounted on this French trailer with the sides and tailgates removed. However, excellent and comfortable as it was, advancing age (mine) made getting dressed and undressed on my knees highly undesirable. So, a further change was necessary. A combination of equal aerodynamique qualities, with the ability to stand upright! First trip out. Parked near Peterborough as we renewed our passports. The picture shows the roof half raised. Before the fitting of the night heater, a desirable precaution in December. The night before on the A1, it had resisted, without a wobble, crosswinds of 65 mph! Enter the Eriba Puck. Light, though not quite as light as the Teardrop, equally aerodynamique, and old. 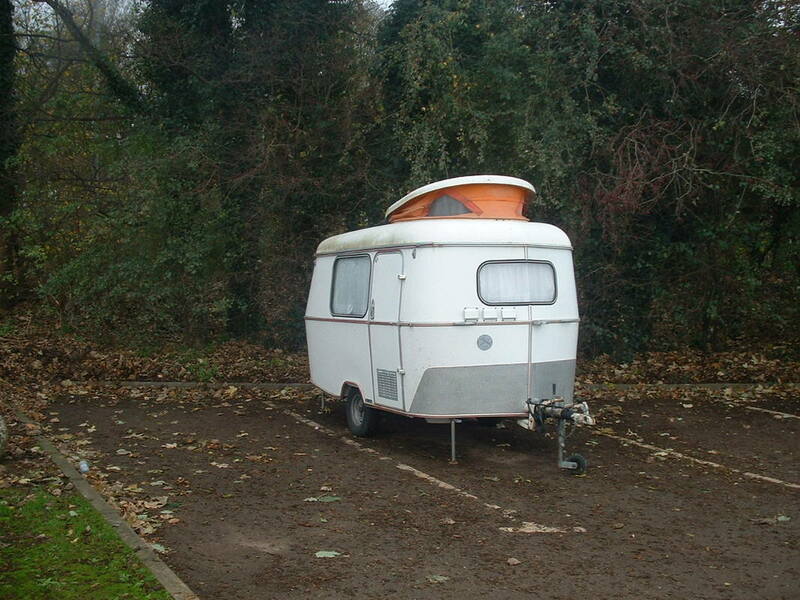 If the Teardrop was super modern, the Romahome (built 1985) old, the Eriba (circa 1972) is positively ancient. However, it tows like a dream, and has, with the roof raised, space. I can stand up, heat a kettle of water on the little stove, and wash with that in the little sink. Although I almost always park up at night at routier restaurants, it gives me a degree of independance that I hadn't had before. Winters are no problem, a propane powered (from the same bottle that powers the stove) night heater has been added and is extremely economic. I carry a spare bottle, but have only changed it twice in 18 months. Summers are equally comfortable. There isn't an air conditioner but the 4 generous ports (mosquito netted) in the raised roof gather the slightest breeze from any direction. It has its problems, the interior fittings, designed for lightness are rather fragile and suffer from the less than soft suspension. I recently had some problems with punctures. The wheels were designed for tubed tyres and tubes cannot always be easily found these days. However, one very knowledgable independant tyre fitter tried fitting tubeless tyres to the existing rims. Result, at least 5,000 trouble free kilometres since! The Partner, with Berlingo to the rear, and Eriba to the left. So now, the latest addition. 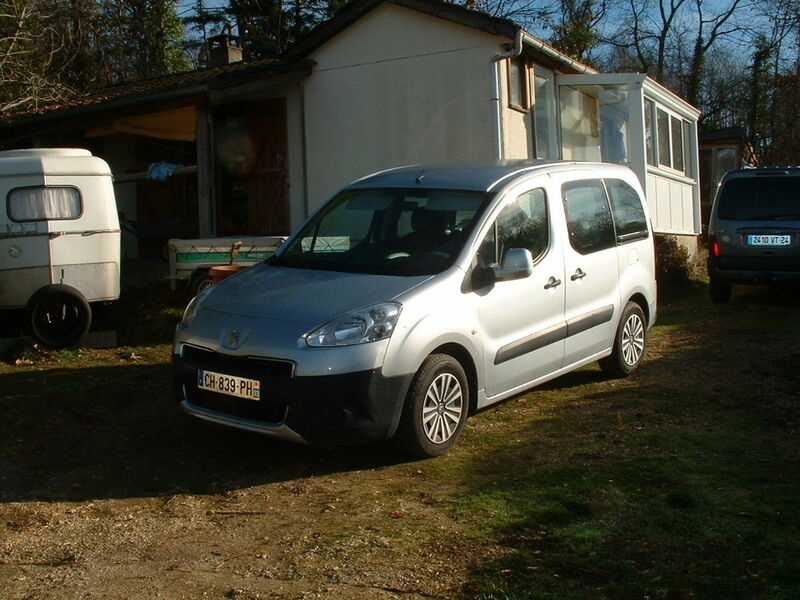 This is the Peugeot Partner which has replaced the Citroen Berlingo (seen in the background) and which arrived in December 2016. The reason for the change was twofold. 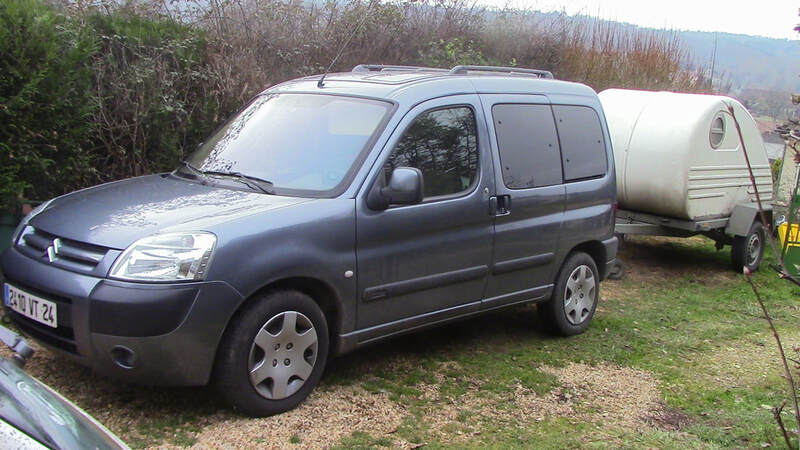 The Berlingo, having done getting on for half a million kilometres was ready for an honourable semi-retirement, and my poor old left knee and right arm, demanded the change to an automatic. There is a third reason, after the accident which ended the life of our then 2nd car, the Citroen Saxo, we were left with just one. A rare breakdown with the Berlingo (gearbox) left us without transport for a couple of weeks and entirely reliant on generous friends and neighbours. In our quiet and shopless rural environment, absolutely essential.